CantMissCoupons is the clone of such infamous ad-supported programs as Find-Me-Savings and Majestic Coupons. Needless to say, all three of these programs promise users to provide them with coupons, savings, shopping deals, discounts, and other kinds of beneficial deals. The problem is that these programs might showcase attractive banner advertisements, pop-ups, and interstitial ads that cover the entire screen. This is the main reason why computer users do not rush to remove CantMissCoupons or any of its clones. If you continue reading this report, you will learn why it is important to delete this adware from your operating system. Many computer users realize that CantMissCoupons is unreliable and might deserve removal before even installing it onto their browsers. Authentic and reliable programs usually have official download sources, and they have good reputations. CantMissCoupons has neither. The installer on cantmisscoupons.com has not been activated yet, and, besides the information on this website, there is no positive feedback about this program. According to our research, the distribution of this advertisement-supported program is in the hands of third-party software distributors, and trusting them can be risky. Unfamiliar distributors could bundle the suspicious ad-supported program with programs that you might have to delete from your operating system as well. 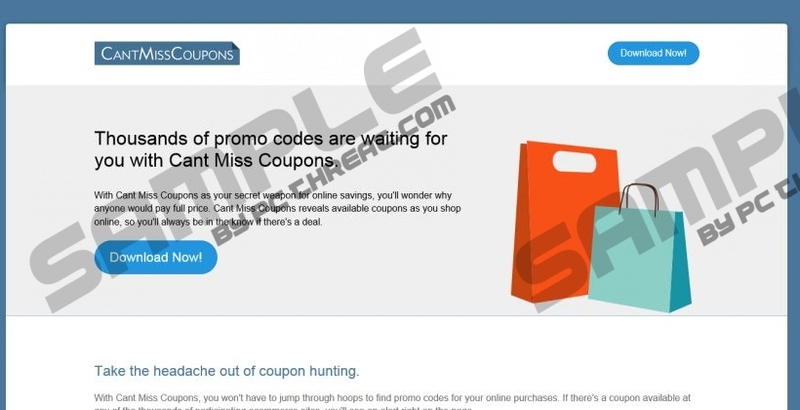 The questionable CantMissCoupons should reveal available coupons when you shop online. This means that this program tracks your activity to learn when and which sites you visit. Unfortunately, this does not mean that this adware will not inject ads into sites unrelated to online shopping. When it comes to the coupons “revealed” by this program, we cannot guarantee that they will be authentic or useful. Considering that CantMissCoupons serves third-party advertisers, it is likely that instead of showing the best deals, you will be introduced to the deals created by these advertisers. Needless to say, this is a valid reason to delete adware. CantMissCoupons can employ various technologies to track your virtual activity, including beacons and HTTP cookies. You might have to delete these technologies after removing CantMissCoupons itself. If you do not eliminate them, the creators of this ad-supported program and affiliate parties will keep collecting information about your virtual activity, which could be used to your disadvantage in the future. Hopefully, this is not something you will have to deal with, and to make sure that it doesn’t, we advise deleting the suspicious ad-supported program right away. Follow the manual removal guide below to eliminate this adware. Once you are done removing CantMissCoupons from your browsers (Internet Explorer, Firefox, and Chrome), you have to check if you need to delete leftovers. It is also important to check if your operating system was infected with other potentially dangerous threats. Employ a legitimate scanner to examine your operating system and help you see if you need to delete any threats. Since manual removal is not for everyone, we suggest an alternative, automated malware removal software. Install this software, and you will not need to worry about CantMissCoupons, other infections, or the protection of your operating system. Launch IE, tap Alt+T, and choose Manager Add-ons. Move to the menu on the left and click Toolbars and Extensions. Disable the undesirable extension and click Close. Launch Firefox, tap Alt+T, and click Add-ons. In the menu on the left click Extensions and Remove the undesirable extension. Launch Chrome, tap Alt+F, and move the cursor over More tools. Click Extensions to access the chrome://extensions/ menu. Identify the undesirable extension, click the recycle bin icon, and choose Remove. Quick & tested solution for CantMissCoupons removal.